Joey W. Hill says, "You’re in charge, x 3!" Enter this contest, and the winner gets her/his choice of three signed Joey W. Hill titles. Your pick! Contemporary, paranormal, backlist, future release – anything goes! Blurbs and excerpts about all her books can be found through the Books Available link on her website. 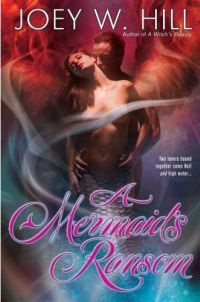 Growing up the daughter of a famous mermaid and the second in command of the angelic legions can put a lot of pressure on a girl. Though she loves her parents, Alexis has chosen to live among humans as an ordinary college girl, but she can’t hide the tranquil aura of angelic light and empathic ability that draws people to her. Unfortunately, while it draws men to her, none of them are willing to cross the line to find her true heart and soul – or even give her a decently passionate kiss. That is, until she begins to dream of a male trapped in fire and rage, who wants her so badly he’ll tear the universe apart to have her. However, while all she can feel is his pain and suffering, and a yearning to heal him, Dante sees her as the way to his freedom. He thinks he’s willing to destroy her to accomplish that, but once he kidnaps her into his world and is confronted with the girl who is the opposite of everything he’s ever known, he starts to wonder if his freedom is as important as keeping her by his side. You will be added to the Joey W. Hill mailing list to receive occasional notices of interest. You'll also be added to the Fresh Fiction News. Unsubscribe options are available with each issue.